When it comes to branding and marketing, the difference is in the details and custom tape can help you utilize your product shipments for that extra branding and marketing space. Custom Tape is a great branding and marketing tool, if you know how to leverage it well. A meter of custom tape wrapped around your shipping box or container can make a huge difference to the overall appeal of a shipment as well as add a classy, custom touch to your product. Here are some tips to design your custom tape and some ways to use it on your shipment to enhance product shipping. Before you can use custom tape in your packaging for branding, you need to design your custom tape so that it is an ideal representation of your brand name. Here are some ways to design your custom tape using various types of logos and impart a unique touch to your products. 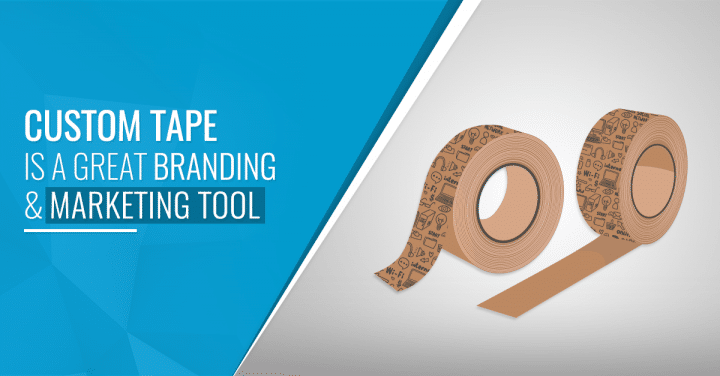 Your custom tape should have your logo on it for the most effective branding impact. There are several different ways to exhibit your logo on your custom packing tape, however. The “minimal logo” custom tape has only your logo printed on it with no other clutter. This type of design look neat and tidy and the customer’s attention will be directly attracted towards your company logo. It’s a very effective way to showcase your brand. A handwritten font used for a message or company name is a great way to keep your branding genuine and personalized. It adds a rustic charm to your product and can be the focal point of a good custom tape. Choose a handwritten font that is synonymous with your brand and experiment with a few fonts until you find the perfect match. You can even use a calligraphy font for added elegance. A striking illustrated logo or icon is a great way to turn your drab shipping box into an eye-catching package. Enhance product shipping with bold shapes and fun colors. You can either keep the packing tape background a solid white color with bold black designs on it, or you can keep the logo a solid color and experiment with the background color. These are a few ways to design your custom tape to improve your branding and enhance product shipping. By getting creative with your custom tape design, you can get way more out of an ordinary product box. Want to try it yourself? Give us a call at Jet Label & Packaging, we’ll help you every step of the way.